Chimamanda Ngozi Adichie is a Nigerian author and immigrant to the United States. Her work has been translated in over 30 languages. Her novel ‘Americanah’ is an immigrant tale and inspiration to many authors sharing similar subjects. 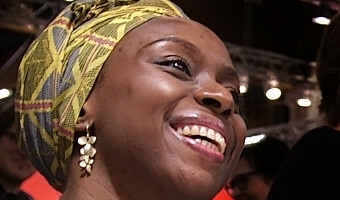 In the picture, Adichie is visiting the Helsinki Book Fair in 2014. Picture: Tony Öhberg for Finland Today In late October, about fifty participants from all over Finland attended a seminar entitled “Today’s Literature, Tomorrow’s Literary History: Do Immigrant Authors Transform Finnish Literature?” The attendants at the Great Hall of the Finnish Literature Society SKS in the heart of Helsinki were mostly immigrant authors residing in Finland along with scholars, researchers and anyone engaged in literature produced by immigrant authors. The event was a part of the project “Toward More Inclusive Finnish Literature,” conducted since January 2018 at the SKS. The diverse programs not only … [Read more...] about Do Immigrant Authors Transform Finnish Literature?